I was shopping at Target the other day with one of my stampin friends and as we passed the greeting card section I asked her, "How long has it been since you've walked down the card section of a store"? She laughed and replied, "it has been YEARS!!!". I said, "ME too, I don't think I've shopped for a card in over 17 years". Most of the cards I receive are hand made but occasionally people will send me store bought cards and I don't mind at all, I think the act of taking the time to send a card is such a thoughtful gesture, especially now a days! Most of the time however when I do receive store bought cards it is because the person sending it is not a crafter. So when my very crafty friend came to visit me bringing me a card and gift, I had to smile when I saw that her card was store bought. As I opened up the envelope, I saw the name impressed on the back of the envelope flap. You know the name from the company that makes tv commercials that make you cry. The same company that makes the cheesiest love story movies that I am not ashamed to admit I'm addicted to, LOL. So I pull the card out of the envelope mentioning "the name" with a smile on my face and my friend starts to laugh. It was a REALLY good laugh! She knows exactly what I am thinking, I don't have to say a word! I smiled and laughed too. It felt good to laugh especially with her. The funny thing is, it LOOKS hand made, don't you think?. Although my friend and I laughed about it being store bought, I was especially touched that she would take the time to not only bring me a card but with it a beautiful Brighton Power of Pink Bracelet. You see, my friend said she wanted to do something for me because of what I went through. The thing is, she understands fully because she went through and is STILL going through the same type of situation. The challenging part is her cancer was invasive and her treatments are on going and have been really difficult for her. What I went through pales in comparison with what she is still dealing with today. It is those circumstances that have kept her from crafting and doing the things she loves. As we spent time together, we laughed and I told her that her card was beautiful and that it "INSPIRED" me to stamp something similar. 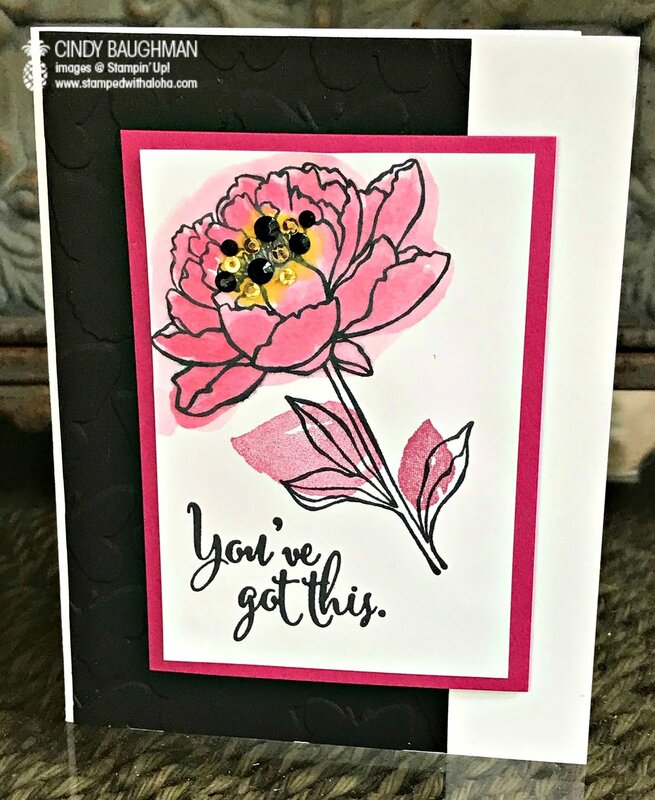 I told her "I'm going to use this card as my inspiration to create a card with Stampin' Up! products." She smiled and asked, "Are you going to do it right now? ", I said, "Set your timer for ten minutes and don't watch me". So I gave her a Stampin' Up! catalog to look at and I went to work. On your mark, get set, GO. The challenge was on and in exactly ten minutes, this is what I made. To make this card I grabbed the first set that had a similar flower. It was the set called You've Got This. I grabbed my black ink pad and stamped the flower. I watercolored it with an Aqua Painter using Rose Red Ink, Daffodil Delight Ink and Sweet Sugarplum Ink. When I watercolored the leaves I just tried to follow a similar pattern by coloring way outside the lines. I also used the Fluttering Textured Embossing Folder to add butterflies to the black background piece of card stock. This represented the beautiful gift I received along with the card. 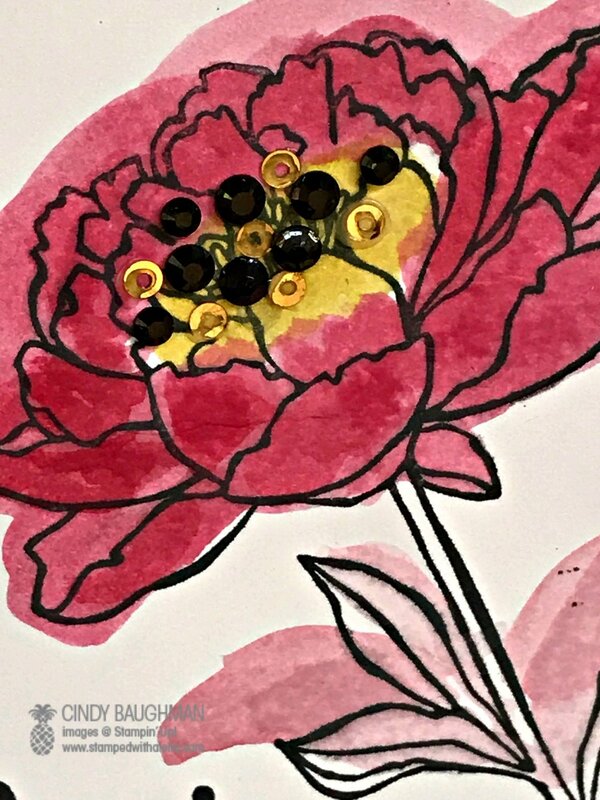 To finish the card I added some of our new black rhinestones and some mini gold sequins I had left over from our Water Color Christmas Card kit. I love the black and gold sparkly details that give this card the perfect finishing touch. When I finished stamping we both sat and looked at the completed card and smiled. I told my friend, I'm making this card for you! However you can't take it today cause I need to write a message in it and I'll send it to you soon. As I looked at the card suddenly it hit me. Of all the stamp sets in my entire stamp studio the one I choose in ten minutes or less was You've Got This. My mission was to copy a card and then give it to my friend. My beautiful, vibrant, strong friend who has been going through a challenging season. It felt like a divine moment where the words in this set were the exact message God wanted her to hear. With all she is going through she needed encouragement. Do you want to know what other sentiments are in this set? One stamp says, "Good Things ARE going to happen". Another image says, "I'm HERE for you" and of course the one I used which shares the same name as the set, "You've Got This". Prior to sending it I looked at it one more time and noticed that the leaf images in the original card look more stamped than watercolored. So I made a second card. This time rather than watercoloring the leaves I used Sweet Sugarplum Ink and I stamped over them using leaves from the Bunch of Blossoms stamp set. I used two different generations of the ink so one would appear darker than the other. I also used a Daffodil Delight Stampin' Marker to color and brighten up the center before I added the embellishments. I think both versions of this card turned out beautiful and I hope my friend will act surprised when it arrives in her mail box this week. I Thessalonians 5:11 says, "Encourage One Another and Build Each Other Up"! I hope that when my friend receives my card that she will feel that way, the same way that she made me feel when she came by to visit me. This week you will encounter many people who need love and encouragement. It may be people you know or someone you've never met. As you go through this week I hope you will remember that you have the power to make a difference. Thank you "friend", you know who you are, for making a difference in my life. Be strong, Be Courageous, Keep Fighting and Remember You've Got This!! !